Suzanna Fatyan, one of Uzbekistan's finest tour guides, is also an obsessive foodie. She hunts down seasonal foods, and visits markets and restaurants all over Uzbekistan. 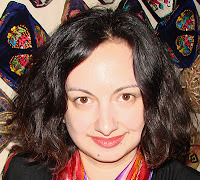 Suzanna will contribute regular articles recommending the best places to eat in the cities visited on Uzbek Journeys tours, as well as pieces about Uzbek cuisine. Following her reviews of Samarkand and Tashkent restaurants and cafés Suzanna now invites us to the magical city of Bukhara. Bukhara…for me this city is the most charming, romantic and spiritual in Uzbekistan. In Bukhara you feel the true Orient, you dive into a different time and experience a rhythm of life like in our ancestors' days. I imagine them travelling along the Great Silk Road, enjoying tea and chatting in caravanserais, exchanging the latest news at colourful bazaars and learning about unusual and peculiar goods. Once you arrive in Bukhara you immediately sense its powerful energy: every sound, every aroma and view hypnotizes you. You might think it is random, but it is not. For centuries Bukhara served not only as one of the most important cultural and economic crossroads of the Silk Road but also as a centre for different spiritual practices known worldwide today. In Bukhara you understand why writers and poets admired the Orient, why their eyes and hearts were directed to that world that seemed so far away. Bukhara has atmosphere, it opens its soul to everyone. 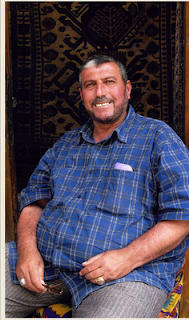 Talk to any person in Bukhara and you feel as if this person is your relative or the friend you have known since childhood. You speak the same language, think, joke and dream in the same way. The hospitality of Bukharan people is legendary: after being a guest with a Bukharan family be ready to gain 5-7 extra kilos! An important feature of Bukhara is that there are not only beautiful mosques, madrassahs and impressive minarets but also authentic merchants' houses: these are not museums. They are alive. People live in them, take care of the amazing interiors and iwans; they preserve the special spirit of the old courtyards. Families proudly show all the beauty of their houses to travellers and guests; they happily invite you for a piala (traditional small bowl) of tea along with sweet local raisins, delicious almonds, pistachios and halva. It seems unusual to start with talking of dessert first, however, it has been a centuries-old tradition to serve tea and fresh and dried fruits first, before the main meal. Today, influenced by European culture, this custom has changed. However, I recommend you follow the old custom and visit the Silk Road Tea House and Spice Shop the day you arrive in Bukhara This wonderful chaikhana is very close to the Second Trade Dome, at 5 Halim Ibodov St. (tel. +998 65 224 2268, +998 65 306 2520). The tea house not only serves excellent teas with ginger, cardamom, cinnamon, and saffron but also excellent coffee and the best halva in the world. The hospitable Ubaydov family that runs the tea house can prepare Bukhara plov for you, if you order in advance. It is much lighter than the one you tried in Tashkent and Samarkand, but substantial enough to give you the energy for walks around the city. The distinguishing feature of Bukhara plov is that it contains red carrots (in Samarkand we use yellow). Moreover, people frequently add dried apricots and raisins to it. So everything depends on the region, the preferences of family members and the mood of the chef! 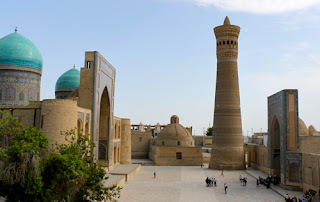 Believe me, in Bukhara you can walk for hours and never weary of the place. 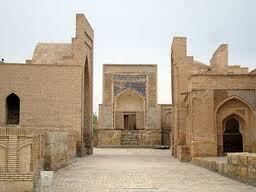 Located almost in a desert, Bukhara does not have the turquoise of Samarkand. Instead a sandy colour prevails in its architecture. Gazing at the city you immediately imagine camels loaded with spices, gold, lapis lazuli and of course precious silks…..Intoxicated with so many impressions and emotions you should stop for a while to absorb everything your guide may have told you and everything you have seen. A good place for such a stop is a little restaurant in the old quarter of the city, also rather close to the Second Trade dome, called Minzifa, at 6 Hudjarushnoy St. (tel. +99865-224-61-75). Minzifa serves both European and Uzbek cuisine, wonderful Turkish coffee and homemade cakes. But it is not just the kitchen that attracts me to this restaurant. Minzifa has a roof terrace from which you have a splendid view. I suggest you visit Minzifa for dinner and I encourage you to reserve a table in advance because terrace seats are very popular. That said, the ground floor is also nice because Minzifa is located in a private house. Bukhara's rich cultural heritage extends beyond the old city's walls. Chor Bakr is a necropolis about 7 kms west of the city. Should you visit, I recommend the chaikhana Chor Bakr. Although the place is very modest, it is always crowded. People come from far and wide to taste the delicious lamb served there at lunch time. The shashlyks and kebabs go well with local non (bread) and masterly sliced onions. 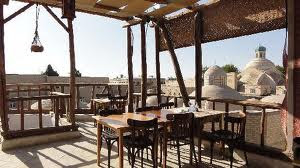 Another highly recommended chaikhana is located between the Bakhauddin Naqshbandi memorial complex and Sitora –I Mohi Khosa, the summer palace of the last Emir of Bukhara. This spot is known among local people as Obi Samarkand, because it is close to the water supply system bringing water from Samarkand. Obi Samarkand has a big choice of traditional specialities, but one of them deserves special mention. We call it manty. 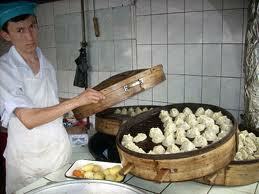 Manty is a steamed dough filled with tender sliced or minced lamb and onions. It goes very well with chakka (suzma in Tashkent), which is a very delicious local yogurt, rather like Greek tzatziki. Returning to the old city of Bukhara where once again the trade domes and caravanserais impress you with fine miniatures, small wooden boxes, silks, and jewellery. Again you do not notice the time...suddenly you feel exhausted and realize it is getting dark but you would like to continue socializing with Bukhara people! 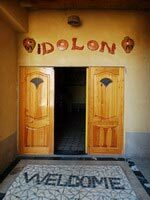 So today you may visit another popular spot among locals and tourists - Dolon restaurant. Dolon specializes in Uzbek cuisine, but also has some European dishes. It offers shashlyks, shurpa, and a good choice of fresh salads. The place is very popular for birthdays and other celebrations and can get very crowded and a little noisy. Dolon is located between the Second and Third Trade Domes, at 27 Haqiqat St. (tel. +99890-274-53-66). Another place I recommend for dinner is Bella Italia. This cozy Italian- style restaurant is not far from the old quarter and popular with local people. The restaurant offers pizzas, good salads and a warm atmosphere. Located at 125 B. Naqshbandi St. (tel.+998 65 224-58-21), Bella Italia is very easy to find. When visiting Bukhara it is important to experience its tandyr: lamb prepared in a traditional tandyr oven. I have already mentioned this wonderful dish in my previous articles. People who come for tandyr usually forget about their work and problems, and headaches disappear. This is because tandyr is something really very special. Ismail chaikhana, at 23 Sultan Djuraev St, is one of the spots where you can try this speciality! Bukhara is an ancient city. But it is always interested in changing its face, like a beautiful woman who uses different make up every evening. One place showing another face of Bukhara is the Golden Dragon restaurant at Muhammad Iqbol St. (tel. +998 90 712 88 85), very close to the Rendezvous café. If you suddenly feel like Chinese food, this is the place in Bukhara. It also serves European and Uzbek meals.